Crispy on the outside, moist and tender on the inside, our pork schnitzel makes you ask yourself if these came straight out of Oma’s kitchen! 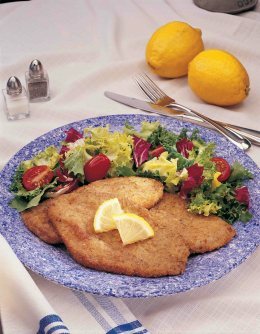 There is only one secret to what makes our pork schnitzel so good – over the years of developing the perfect recipe in our kitchens, we have never compromised on old-world quality, taste and nutrition. Only prime cuts of all natural pork are good enough for your family. Always free of growth hormones, antibiotics and animal by-products, we allow the natural flavor of our pork shine through. Our breading is blended in house with fresh herbs and spices in the old-world tradition to maintain the quality and integrity of the product’s natural goodness. Every one of our products is our best product, we compromise nothing to ensure you and your loved ones are getting the finest meals possible – just like Oma wanted. At Meaty Meats, recipes are formulated with a discerning palate, not a formula. Your best interest is kept in mind when producing a product that is nutritious, flavorful and fit for your family. For great meal ideas, please follow or recipes link today!